The bright spring sunshine and low sun is a great opportunity to design and build sundials in your school grounds. The lesson plan below outlines how to do this in creative and interesting ways. To create a simple device on the ground capable of measuring time using the sun and its shadow effect. Large stake or post, mallet, spirit level, rope/twine and pegs, card or laminated sheets for marking the parts of the sundial. To learn about the processes of estimating, measuring and calculating. Exploring time and the relative position of the sun in the daytime sky. Understanding the position of the sun according to the seasons and time of year. Understanding the position of the sun according to our place on the earth. Learn to work collaboratively in small groups. Find a large open space of level ground (preferably grass) that will receive sunlight for most or all of the day. Spend time in class discussing the position and movement of the sun according to time of day, time of year and our location on the earth. Have pupils plan out their approach beforehand. 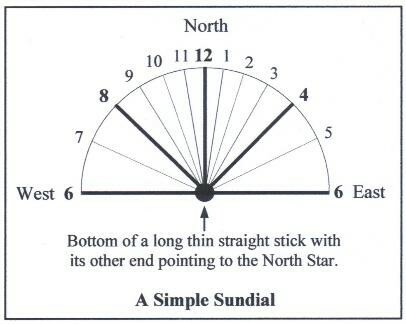 Form the group into small teams and have them select their spot for building a sundial. 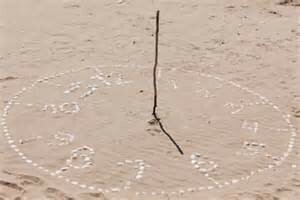 Place a large stick or stake into the ground where they want their sundial to be positioned. You may want to use a mallet to ensure it is well secured into the ground and a spirit level to ensure that it is completely vertical. Use a magnetic compass to determine the directions west, north and east (the difference between magnetic and true north should not make too much difference). From the base of the stake draw or mark with string a straight line from due west to due east. Then do the same with a line going from the base of the stake due north. Place a number 6 at each end of the east-west line and a number 12 at the end of the north line. ​Now mark a line that approximately divides the left (west) side of the sundial and position a number 8 at the tip of that line. Repeat the process on the right (east) side and position a number 4. Keep repeating this process until you can halve and halve again the radiating lines and create the number sequence as shown in the picture. Discuss what the most complex elements of the activity were. Compare the times recorded with accurate chronological times. Discuss next steps for the exercise and if the pupils would like to create a more permanent version in the school grounds. 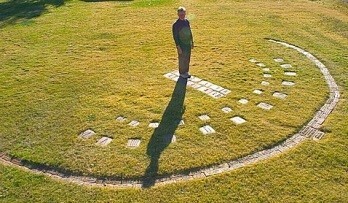 Visit other sites where sundials have been created. Try constructing a selection using different methods (including portable versions) that can be created indoors and brought outside. Try creating a version where humans act as the measuring device. This can be done by designing a permanent version using inlaid stone slabs (as shown in the picture above) or by using mats or carpet tiles for a temporary version. 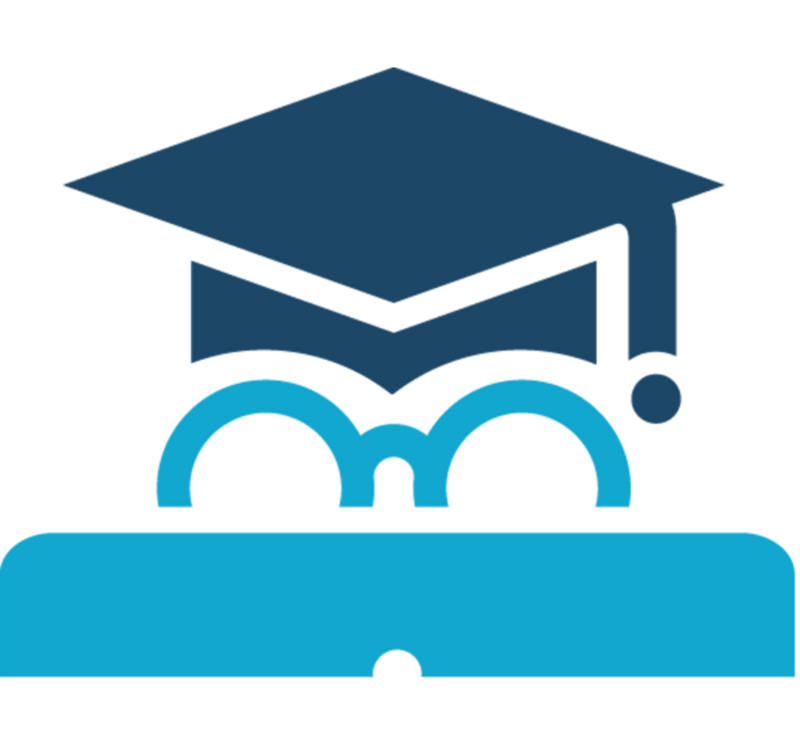 Ensure that there is a regular log of times taken and accuracy levels assessed.